laboratory jack, an all purpose constructed from stainless steel, mild steel. Suitable for hot plates, burners, baths, glassware many more items. Use: For lifting and holding several equipment and instruments in a laboratory. Laboratory Jack:- Laboratory jack are available in all sizes, as per clients requirement and specification. This product is used for lifting up any product. We are one of the leading Laboratory Platform Jack Manufacturers, based in India. 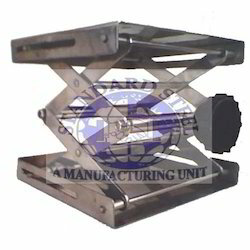 We provide sturdy and long lasting Laboratory Jack for research works and industries. We procure raw materials from well reckoned vendors to ensure the quality of our Laboratory Platform Jack. B. B. Dey & Co. Being a leading firm in this industry, we are deeply engaged in offering a high-quality range of Laboratory Jack. Laboratory Jack is ideal for use as a support when installing and uninstalling the diffusion pump on the Ladd Vacuum Evaporator. Also used to sustain hot plates, flasks, beakers, baths, and other lab items. 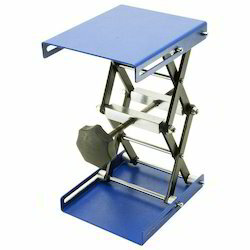 The top and bottom plates can be fixed to lab equipment or a bench by drilling and attaching with appropriate fasteners. Most regular type made of M.S. having 20x15cm plate form size, 140/330mm Height, maximum load 25 kg, With load plant from of 20cm x 15cm close high 8 cm open hight 22 x 5 cm adjustable at any height.